Your Favorite Eye Shadow or Shadow Stick: I used the gorgeous shimmering charcoal shade from Stila’s new Eyes Are The Windows Shadow Palette in Body on Bria’s top lid and Eyeko’s Alexa Chung Me and My Shadow Stick in Charcoal along the bottom lid. Crease Brush: If you haven’t picked up Laura Mercier’s Ponytail Brush yet, you are missing out! 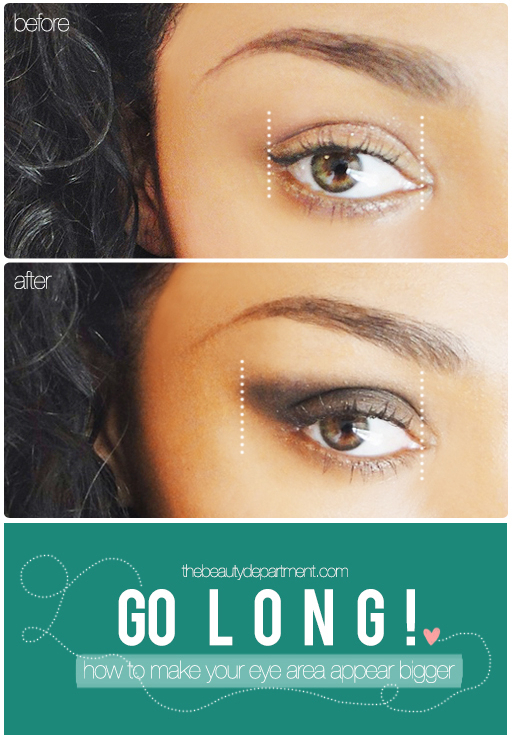 Sweep the shadow all over the lid and crease then start pulling it outward along the crease as demonstrated above. Switch to a clean brush and blend back and forth like windshield wipers. Trace the shadow along the bottom lashline, continuing past the outer corner until you meet the top shadow. You can use any color in the rainbow but I love it in a dramatic charcoal like above or in a soft shimmer pearl or a matte smoky taupe! You can line on top of it but it will detract from in a little. Don’t forget mascara!